Activity Book corresponds with the Money Deck cards. The Activity Book provides an enjoyable way for students to practice and master basic math skills, without the use of routine drill and daily worksheets. The activities and games engage students as they develop their ability to think critically and solve problems. They can be readily used in the classroom, in activity centers, or at home. 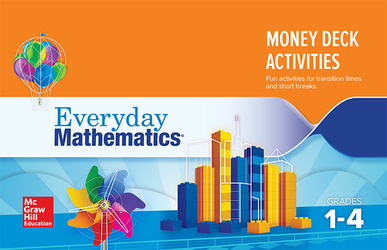 The Activity Books provide information on using the card decks with the Everyday Mathematics 4 curriculum. They also include activity and game directions written especially for students, as well as suggestions for readiness and enrichment modifications. In particular, resource teachers will want to use the card deck activities to individualize instruction and provide additional reinforcement of math concepts taught in the classroom. The Activity Book includes the directions for over 35 activities and games for small groups, partnerships, or individuals to play or work on with the card deck. Each activity or game lists the object, the skill being practiced, the number of students, any additional materials needed, and has a table showing how it can be used across the grades.